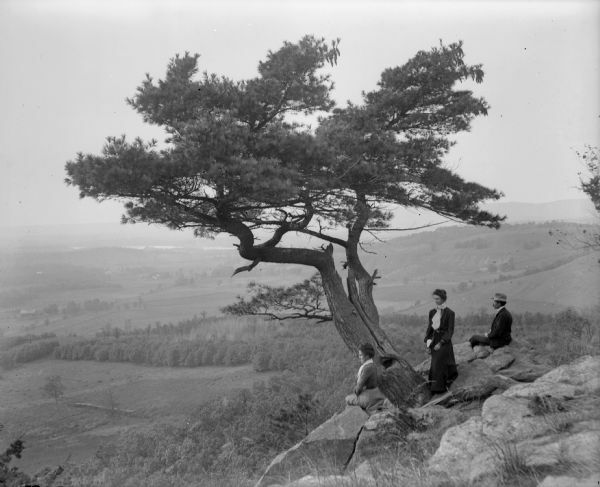 Harry Ellsworth Cole (1861-1928) was a "nature lover and history lover." That's how historian Louise Phelps Kellogg remembered her colleague in her forward to Cole's book, "Stagecoach and Tavern Tales of the Old Northwest." The collection of Cole photographs at the Wisconsin Historical Society reflects those two loves. Although a native of Indiana and a journalist by trade (Cole was co-founder and editor of the Baraboo Daily News), he worked tirelessly to document and preserve Sauk County's and Wisconsin's natural beauty and history. Cole photographed scenic views of the Dells and Devil's Lake area as well as geological features throughout Sauk County. By including people in a number of the views, he provided a frame of reference for both physical scale and historical context. In 1905 Cole helped found the Sauk County Historical Society and served as its president until his death in 1928. Cole recognized the irreversible changes that modernization brought. 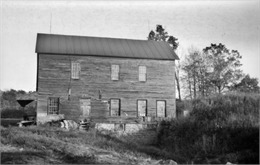 By the early 20th century, many of the dwellings, taverns and inns from Wisconsin's territorial and early statehood days stood abandoned and derelict. Others had been altered as styles changed or function dictated. Cole photographed many of those buildings, and the images constitute a large portion of the collection. In addition to taking photographs, he collected stories of the historic inns from surviving early settlers and their descendants. He organized these as a magic lantern show and lecture which formed the basis for his book, "Stagecoach and Tavern Tales of the Old Northwest." The book, unfortunately, was incomplete when he died. At the request of Cole's wife, Dorothy, Louise P. Kellogg prepared the manuscript for its publication in 1930. Cole also compiled and provided photographic illustrations for the comprehensive "Standard History of Sauk County Wisconsin" of 1918 and for a guide to "Baraboo, Dells, and Devil's Lake Region." That booklet was first published in 1920 and reprinted several times over the next decade. Many photographs used in those publications are in the collection. In 1920 Cole and several other professional men formed the "Heart of the Hills Walking Club." On Mondays during the winter months, club members would hike several miles from downtown Baraboo to a cottage at Devil's Lake for a noontime meal and a lecture or sermon by one of the group. The club's logbooks, also in the Wisconsin Historical Society's archives, include notes on the lectures and meals as well as photographs by Cole. These good-humored reports reflect the high spirits and broad interests of the members. H.E. Cole was on the board of the Society's governing Board of Curators, serving as president at the time of his death. He was among the first class of recipients of the Lapham Medal awarded March 15, 1926. The medal, given by the Wisconsin Archaeological Society, recognizes "distinguished service in anthropological research." Baraboo Bear Tales - A book published by Baraboo News Publishing Co., Baraboo, WI, 1915. A Standard History of Sauk County, Wisconsin - Published by Lewis Publishing Co., Chicago, IL, 1918. Baraboo, Dells, and Devil's Lake Region, with Maps and Illustrations - Published by the Baraboo News Publishing Co., Baraboo, WI, 1920. Stagecoach and Tavern Tales of the Old Northwest - (Louise Phelps Kellogg, editor) Published by The Arthur A. Clark Co., Cleveland, OH, 1930. Reissued by Southern Illinois University Press, 1997.